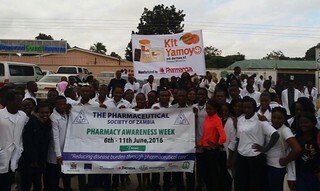 Thanks to the active engagement of the Kit Yamoyo manufacturer in Zambia (Pharmanova), Kit Yamoyo had a very high profile during the parade through Lusaka on 7-Jun-16 by young pharmacists during Pharmacy Awareness Week (7 to 11-Jun-16). The parade made the national TV news. 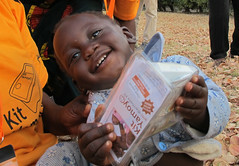 This weekend the Pharmaceutical Society of Zambia (PSZ) will also hold their AGM and Annual Conference in Livingstone and we have co-funded Pharmanova to be a conference sponsor which will provide the opportunity for a presentation on Kit Yamoyo at the AGM, an advert in the conference programme and a Kit Yamoyo in every delegate’s bag. 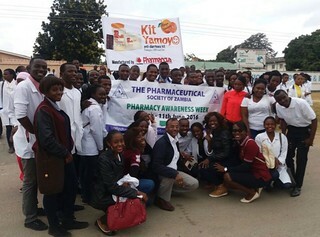 The presentation will be given by Tania Nyirongo, a highly respected pharmacist in Zambia who is also standing for President of the Society. We expect that both of these activities will significantly increase awareness of Kit Yamoyo across Zambia and help us meet our goal to sustainably establish Kit Yamoyo in the private sector market by mid-2018. 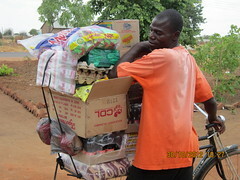 Good work done in Zambia. Request to consider Kenya in future. If you know of such a partnership, or an enthusiastic individual, that would want to make something happen in Kenya please put them in touch with us.